WASHINGTON, D.C. -- As investigations into Russia's interference in the 2016 U.S. presidential election continue, Russian President Vladimir Putin's image in the U.S. has worsened. 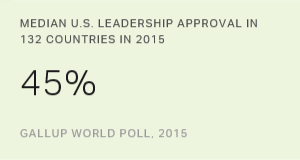 Thirteen percent of U.S. adults now have a favorable opinion of Putin, down from 22% in February. 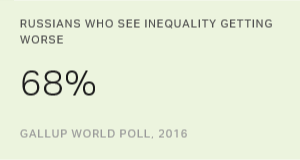 His 74% unfavorable rating is the highest in Gallup's trend. These data, from a June 7-11 Gallup poll, suggest that a steady stream of negative reports about Russian hackers potentially influencing the U.S. election are having an effect on how Americans perceive Putin. The Russian leader's favorable rating was higher this past February than it was two years earlier, with the improvement mostly driven by Republicans. The February improvement may have been attributable to President Donald Trump's seeming embrace of Russia amid his presidential campaign and a backlash against Democrats' condemnation of Russian meddling in the 2016 presidential election. But with Russia's influence in U.S. affairs a constant fixture in media coverage since February, even Republicans may be rethinking their views of its leader. Twenty-four percent of Republicans have a favorable view of Putin, down from 32%. Democrats' already dismal favorable rating for Putin eroded even further, falling from 10% in February to 4% in June. Putin's favorable ratings are low across all education levels, but his image tends to be worse among those with more education. Six percent of those with a postgraduate education have a favorable opinion of Putin, while 16% of those with a high school diploma or less share this sentiment. Putin, who is the subject of Oliver Stone's "The Putin Interviews" this month, has been a unique figure in American public opinion. While never hugely popular in the U.S., he benefited from more goodwill from U.S. adults in the early part of his first presidential term, following the demise of the Soviet Union. After term limits forced him to leave the presidency -- though he served as prime minister for the next four years -- he returned to the office in 2012. Then, a shift in public opinion occurred. By 2014, those relatively warm feelings from Americans had evaporated amid the asylum Russia granted to former National Security Agency contractor Edward Snowden, as well as tensions between Russia and Ukraine. 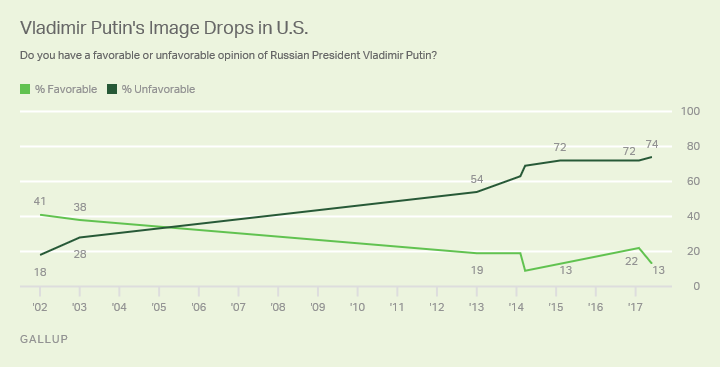 In the past four years, Putin has struggled to break 25% favorability in the U.S. As Americans grapple with and are curious about Russia's potential influence on their government, views of that country are not positive either. Putin's drop in favorability since February shows that he has almost no standing with Democrats, and that Republicans' slightly less negative opinions of the Russian president are retreating as well. The news for Putin continues to get worse, even after the June poll was conducted. This week, former Homeland Security Secretary Jeh Johnson said that Russian hacking happened "at the direction of Vladimir Putin himself." Recently, the Senate overwhelmingly passed a sanctions bill against Russia for meddling in the U.S. election. With Republicans turning against him on this issue, it may be difficult for Trump to advance his stated policy goal of closer relations with Russia through Congress. It is possible that if there is some resolution to the 2016 election imbroglio, and relations between the U.S. and Russia grow warmer, Putin's image could improve somewhat. This development would necessitate more positive media coverage for Putin, something that hasn't happened in the U.S. in quite some time. However, given that only 12% of Americans do not have an opinion about Putin, it may be that they have made up their minds about him and that his low favorability will remain the norm.